Braids have long been a staple in high fashion. The go-to intricate styles are an expression of creativity and are the perfect way to pull hair away from the face. I miss being able to twist my hair into these complex styles since I chopped off my hair, but I hope to try out some braided crowns with my bangs. Braided crowns are one of the most sought out hairstyles on the runway this season. Styles in the past have been very loose and messy. The disarrayed braids were perfectly in tune with summer’s carefree style. But as the weather transitions, so has the appetite for braids. The shows this fall displayed tight, sophisticated braids. This new twist flows right into the chilly season, perfecting the glamorous look. Fashion week for spring 2013 was filled with this popular style of braid. The loose, fishtail style has been seen on young fashionistas all over the country, as well as the models from popular designers like Tory Burch (shown below). This popular hairstyle has shifted with the changing weather. Recent fashion shows have displayed neat, manicured braids. Models from Rebecca Minkoff showed off their version of a braided crown (shown below). This braided look at spring fashion week 2014 swept hair away from models’ eyes and high cheekbones, showing off the whole face. While the braids shown above seem complex for anyone who has not tediously studied hair, there are some more simple options for the rest of us. This step-by-step tutorial clearly outlines how you can obtain a neat braided style called the “Dutch Braid.” This beautifully manicured hairstyle is prefect for any formal affair be it weddings, dances or even a day where you have a few extra minutes to experiment with hair. 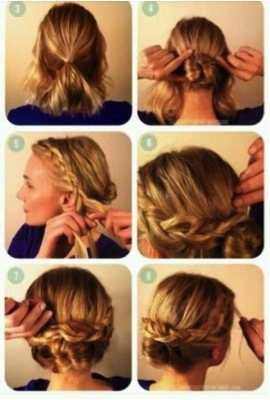 This next style makes an adorable, little braid bun. 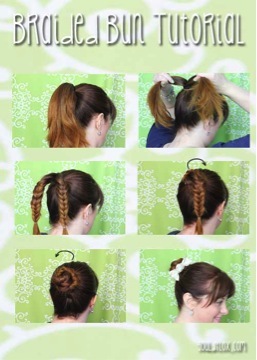 It is a cute way to toss up your hair for those lazy days, workouts and evenings with friends. This braid is easy to style and once practiced, its neat look can be perfected in just a few minutes! These braids are a fun and fabulous way to switch up your fall style. Try one out!